Welcome to the first edition of the School Newsletter in 2019. I especially welcome families new to Peter Moyes Anglican Community School. This year, the newsletter will be published twice per term, first in Week 5 and again in Week 10. Term 4 will see a slightly different schedule, with publication in Week 5 and Week 9. It is hard to believe that the first five weeks of the 2019 school year are now complete. The start of the year has been filled with a palpable sense of positivity, endeavour and accomplishment, with a diverse classroom based curriculum and extensive co-curricular programme keeping our students actively engaged. In addition, we have hosted a number of parent information evenings in each sub school. I extend my sincere thanks to all parents who have attended these events as a strong partnership between staff, students and families is the essential recipe for success at school. While we are always looking forward, I am pleased to report some excellent WACE results for the 2018 Year 12 cohort. The School achieved a median ATAR of 80.65, our best ever result. Combined with a participation rate in ATAR courses over 70%, the Year 12 cohort results compare favourably with our near neighbours and schools with similar demographics to our own. Of particular note, 9 students achieved an ATAR over 95, a sensational result. As much as we celebrate our ATAR Pathway students, we also celebrate the achievement of our General Pathway students who also achieved impressive results last year. 32 students completed a total of 38 Certificate II qualifications, with many students securing direct entry into TAFE and/or the workforce as a result. I extend my sincere congratulations to the entire Year 12 cohort of 2018 and we look forward to hearing stories of your success in the years to come. You will be aware from previous communications that the School has engaged with B2Me, a comprehensive service finding site that allows communities, such as PMACS, to promote and support their local community businesses. Our B2Me page was officially launched on Wednesday 20 February. At the time of writing, 37 local businesses had already signed up to the site. All businesses listed are owned and operated by local PMACS families and Alumni. The B2Me Community Page can be found on the School’s website and through the School App. PMACS families are able to connect with businesses on the site, leave reviews, have access to specials not advertised elsewhere, build a simple directory of service providers and most importantly are able to connect with the people behind the business. By finding service providers you know, like and trust through your personal connections and the broader PMACS Community you will always have peace of mind. I encourage families to explore the B2Me site in support of our school community. Since the previous edition of the School Newsletter, there has been significant building work completed on the new School Chapel. The major structural work has now been finalised, with only the roof tiling to be installed in the coming weeks. Final decisions are now being made in relation to interior finishing’s and furnishings, with the build on time and on budget. Over the past few months, the Chaplaincy team at the School have been busy engaging with the local parish of St Cecilia’s who will utilise the new facility for weekend services and special events. The School is very excited to be entering a partnership with the local parish and look forward to engaging with the parish in the best interests of both communities. The anticipated completion date of the new Chapel is mid-June, with an official opening ceremony likely to be held in conjunction with Peter Moyes Day early in Term 3. Further details regarding both events will be sent to all parents in due course. I recently had the pleasure of attending the Year 12 Ball on Friday February 8th at Joondalup Resort. The theme for the evening was ‘The Enchanted Forrest’ and the venue and decorations certainly lived up to expectations. The event was coordinated by Ms Sharon Marwick and Mrs Karen Swain, with significant assistance from Mr Ryan Walker and Ms Emma Leadon. They are commended for their significant contribution to ensuring the smooth running of this prestigious event. I also commend the students who were members of the School Ball Committee for their considerable contributions. The students were immaculately dressed, well behaved and respectful, with everyone enjoying the hospitality provided. It was wonderful to see our staff, students and invited guests engaging with each other on the night and enjoying such a special evening! Leo CASTILLI – 11D from Venice, Italy. Yuika ONO – 10D from Itabashi, Tokyo. Rongze XU – 9.4 – from Dongying in the Shandong Province, China. The students have been a wonderful addition to our school as they enjoy a cultural experience of varying lengths. The students were enrolled through Anglican Schools Commission International and it is hoped that many more students will join the School through this avenue in the coming years. In addition, we will shortly be having a small group of Japanese students joining us for a four week study tour, with some of the group staying with PMACS families who I thank for their support of this valuable cultural programme. 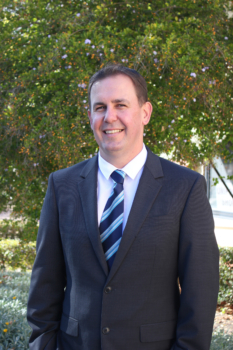 Peter Moyes Anglican Community School is looking forward to the valuable contribution that all of our new and existing staff will bring to our school community in 2019. In other staff news, Mrs Michelle Pestel, Primary Staff Member and ICT & Numeracy Coordinator has won the 2018 ECAWA Educator of the Year award. Being the Western Australian winner, Michelle now becomes the WA nominee in the national awards judged by the Australian Council for Computers in Education. We congratulate Michelle on her success to date and wish her the best for the national awards. As the new school year continues to move along at a rapid pace and staff and students settle into their routines, I look forward to a busy and productive year and engaging with all members of our school community.